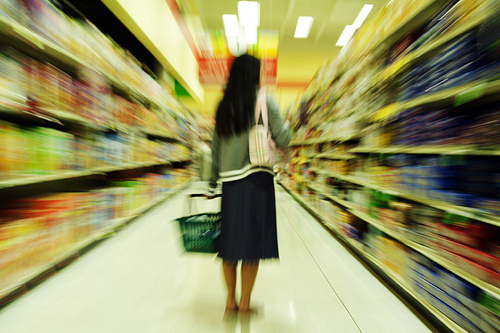 Some people love grocery shopping, and others hate it. Normally, I absolutely love it. I could spend hours in the grocery store comparing items, inspecting produce, checkin’ out the new ice cream flavors… but unfortunately this type of approach is detrimental to my wallet. And since I’m strapped for cash as an intern this year, I’ve had to get serious about my approach to grocery shopping. Eating healthy on a budget is totally doable. Although it’s not entirely fun to be stuck on such a tight budget, you can survive, and I thought I would share my approach. It’s important to look at the big picture before you can get down to the details. This is what works best for me – make one trip to CostCo (wholesale) at the first of the month, and one trip per week to Publix (grocery). I spend 1/3rd of my monthly budget right away at CostCo, but these are things to last me through the month. Brown rice, whole wheat pasta, greek yogurt, marinara sauce, salsa, oatmeal, peanut butter, frozen produce (broccoli, berries, mixed veg, etc), and frozen meats (chicken breast, lean ground beef and sausage). Then I divide my remaining 2/3rds budget by 4 weeks, and I use my weekly trips to Publix to fill in the gaps. If you have a basic idea of what you’ll be eating for the main meals of the week, you’ll be better prepared when actually going to the store. Before I even start a list, I plan out our dinners for the week. I look at the basics of what we have from CostCo and create ideas for 5-6 days per week. Not a full 7 days because sometimes there are leftovers, sometimes we go out and sometimes I just want a big fat smoothie so I’ll make Andrew a grilled cheese. Never step foot in a grocery store unless you know exactly what you’re getting. In order to make trips to the store productive, I make lists. My monthly list for CostCo is generally the same since we eat similarly from month-to-month, but my lists for Publix vary each week. On my lists are items that I need to complete our meals from my plan, and items we run out of. Breakfast items, such as eggs and milk, are usually on the list as well. 4. Hands inside the cart at all times! Don’t buy it if it’s not on your list. Ok maybe it’s something you just forgot to add, but for the most part this rule applies. Put the Cheez-its down and back away slowly. I mentioned this in my Food Philosophy, but try to stick with whole food items. Most of these kinds of foods can be found on the outer perimeter of the store. Once you venture into the middle, a lot of it is processed, competitively priced and just not real (and you risk getting sucked into buying something not on your list, breaking rule #4). Frozen produce is an incredibly easy way to save money. Dollar by dollar it may cost the same as fresh but the fact is, you won’t have to risk throwing out something that has gone bad. There have also actually been studies that show frozen fruits and vegetables may in fact have higher nutrient content since they are frozen at peak freshness. Grocery shopping on a budget doesn’t have to mean sacrificing quality or health. If you take the time to plan and strategize, I promise you can save money and still eat healthy. I avoid Whole Foods like the plague and look forward to the day when I can shop there without turning my nose up at the prices, but in the mean time I will happily abide by my budget. What are some ways you save money at the grocery store?